As of March 1, 2011, Homestead Bank of Cozad has officially acquired First National Bank, Schuyler, and its bank locations in Albion and Howells. New signs and banners (above) were installed at the Albion location last week. 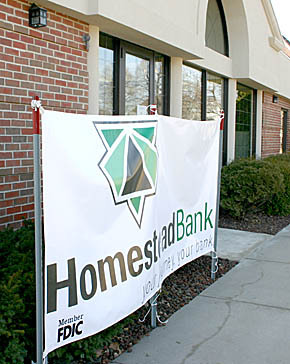 Homestead Bank now operates a total of seven locations. In addition to the three former First National Schuyler locations at Schuyler, Albion and Howells, there are existing Homestead Banks at Cozad, St. Paul, Lexington and Wolbach. Details in the March 9 Albion News Print and Electronic Editions by subscription.